Draw a 7 in x 7 in grid on a piece of fabric and mark it as per photo. Lines are 1/2 inch apart on both directions. Sew the lattice in groups of 4, i.e. 1 – 2, 3 – 4, 5 – 6 and 7 – 8. Then move to the next 4 lot, i.e. 9 – 10 , 11 – 12, etc and complete each pair of lines up to the end of the grid. Then start from the left again in groups of 4 until the end of the line. When moving from one pair of stitches, e.g. moving from 2 to 3, or from 5 to 6, always make a double stitch on the first dot, i.e. on 1, 3, 5, etc. 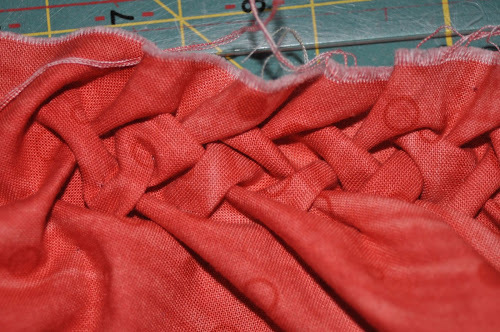 and then make another double stitch after you join a pair, e.g. 1 and 2, 3 and 4, etc. Put needle through 1 and then pick up number 2. Pull both dots together and do a double stitch. Now carry the thread to number 3 and pick it up but do not pull, just do a double stitch on number 3. Now pick up 4 and pull thread to stitch 3 and 4 together. Double stitch there. Now carry the thread to 5 and double stitch. And so on. You will start seeing the pattern after you complete the first line. 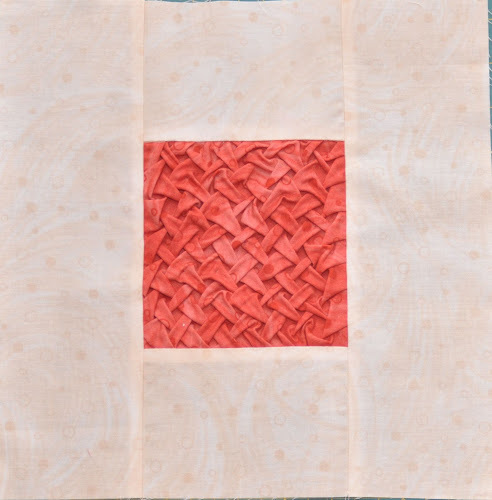 Once you have stitched the grid, you need to stretch the square rather than iron it. Pin the lattice to for ironing board or other padded surface and steam it with your iron. Let it dry. Once it is dry, trim it to 5 inches. Iron the edges no more than 1/4 inches around well before stitching the border. This is one of my favourite blocks so far. The texture is very rich and it looks great in red. This is the 13th block in a series of 25 exploring texture in fabric. Wow, this is kind of amazing! Thanks for the tutorial. I’m eager to try out this texturing technique. This is just gorgeous and I really love being able to see how to accomplish (or attempting to) recreate this look. Thanks Brenda. I’d never done smocking before. It is actually a lot easier than I thought. This is the coolest block ever!!! Can’t wait to try it myself.